As we return to BlackLlightning, I have to say that I am enjoying seeing Jennifer and Khalil’s relationship develop. Although that they are on the run, their chemistry just takes over. So they end up lying low in Khalil’s pad also known as the train cart! This scene allows us to see how young and in love they are, Jennifer talks about her virginity and how she doesn’t want to lose it in current surroundings. Khalil of course feels he same way and gives Jennifer the necklace right at the beginning before they were mixed up in this challenging world. As the pair grow close together, Jennifer’s family continue to look for her becoming desperate. Lynn discovers that Khalil’s safe house could be a train cart therefore she heads out alone going to find them both. As she approaches them she has no idea that they’re both listening. She echoes ‘we’re not a family without you Jennifer’ this is such a key moment as it reflects Lynn’s desperation for her daughters’ safety. The family is the heart of Black Lightning. As Jennifer listens she is obviously torn and conflicted, however, Lynn’s speech is what makes Jennifer return home. But when Jefferson, Lynn’s and Anissa return home they find two of them Khalil is with Jennifer, as he is now a part of her life and family. 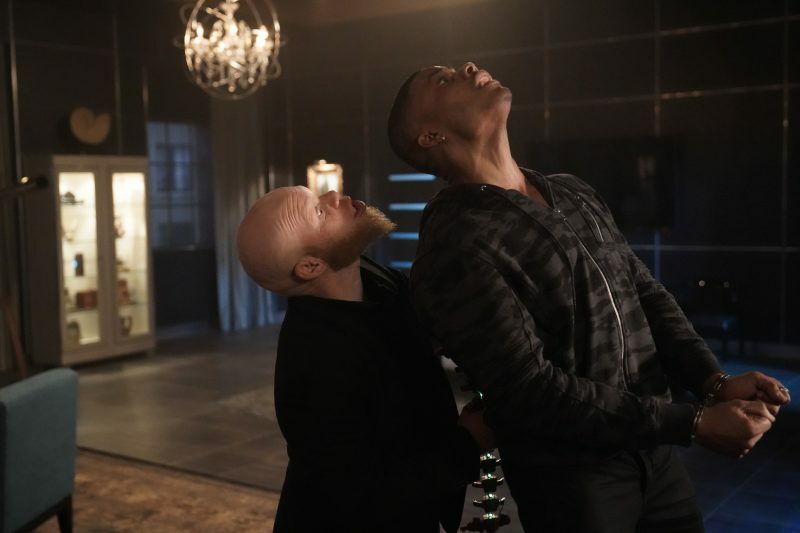 Personally, I would have loved to see Jefferson and Khalil have some kind of moment or bond but Jefferson feels a little reluctant but he does seem to care for him in his own way. After a family discussion, I feel that the Pierce family have some kind of accepted Khalil in their family and now do also care for him. However Jefferson entertains the idea that Khalil turns himself into the police as he has all the knowledge on Tobias and will be able to testify. Maybe this is Jefferson’s faith in the justice system talking but I wouldn’t risk Khalil as it’s too risky with tibias about! We then cut back to Tobias’s luxury home and its official that Khalil has now been replaced. He asks Todd over for a lavish meeting of rich food, his intentions being that he can persuade Todd to unlock the suitcase that he stole from the ASA. We don’t really know a lot of this kid other than he’s very smart with computers and has had difficulty being recognised in society after facing racism. So Jefferson’s plan is put into motion. Khalil is protector by Henderson and Black Lightning thunder nearby the guarded van is ambushed in a tunnel by Cutter, who has finally caught up with him. She single handily kills all officers and what a surprise Khalil is missing. Jennifer is notified by Lynne and she is distraught. So Jefferson’s plan to do the right thing has certainly backfired and Jennifer will find this difficult to take in, as it’s her father’s fault. Cutter takes Khalil to Tobias who talks the talk about loyalty, however instead of killing him; he rips his spine from his back and throws Khalil in front of the church, left to bleed out on the floor. Reverend hold comforts Khalil and calls for an ambulance how Khalil is still alive at this point. It’s so frustrating as Khalil tried to do the right thing but ends up having a tragedy. Will he recover and what’s next for Tobias?